Basset Hound Training – Fundamental Knowledge " "
Making Basset Hound training fun and easy begins with understanding the breed. 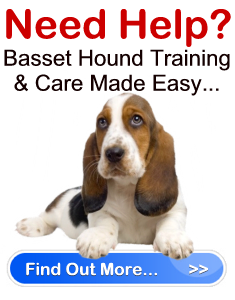 By understanding what makes them tick you will know how to adapt your Basset Hound training to get the best results in record time. Basset Hounds are a sweet, gentle, and devoted breed, known for their long floppy ears and long, stumpy body. They are a naturally well mannered dog and are very peaceful. They adapt well to virtually any family environment and are incredibly friendly, social dogs. The Basset Hound is quite affectionate and enjoys the company of children. Although bred for hunting and equipped with an excellent sense of smell, this breed is not aggressive. Basset Hounds enjoy spending time with their family and love outdoor activities. Their pleasant temperament is often a perfect match for just about any anyone looking for canine companionship. Basset Hounds may have existed prior to the 16 th century, but the first time the breed was mentioned was in a hunting text written by a French man by the name of Fouilloux in the late 1550’s. The Basset Hound was indeed developed in France, as Basset is derived from the French adjective “Bas” which means low structure or dwarf. They are believed to be direct descendants of the blood hound. The Basset Hound breed was bred for tracking and hunting fox, opossum, hare and pheasant. They can hunt alone or in packs and are revered for their superior sense of smell. The Basset Hound was ideal for hunters who were hunting on foot because they could keep up with the slow-moving dog. Basset Hounds were later well received in England and the U.S. during the mid 19 th century. They were recognized in 1885 by the American Kennel club. Basset Hounds are one of the friendliest and least aggressive dog breeds you can own. They are happy-go-lucky dogs that enjoy companionship and the great outdoors. Their devotion, loyalty and affection make them wonderful family pets. Basset Hounds are good and patient with children. They don’t bite, and are relatively friendly with other pets. The Basset Hound is not really a good watchdog and is not a guard dog. Furthermore, although they are very sociable canines, they can be very stubborn when it comes to training and are slow learners when it comes to housebreaking. You also need to keep in mind that the Basset Hound is a natural born tracker, and when outside, if they pick up a scent that interests them, it can be difficult to break them of their mission. Therefore, it is a wise idea to keep them on a leash when walking to ensure they don’t wonder away or chase any small animal down a hole. Or, worse run into danger. This makes the “come” command a vital part of Basset Hound training. The Basset Hound is part of the Hound dog group, and was originally bread to hunt and track small animals. Bassets are very low to the ground and stand an average of 11 – 15 inches and weigh between 45 – 65 pounds, with females being the smaller of the two. Basset Hounds are quite inactive indoors and are happy living in an apartment. That being said, they do require plenty of outdoor exercise, and if permitted will spend hours outside playing and running around. Therefore, they do best in a home with a small yard, but will be fine in an apartment if they are provided with enough daily outside exercise and activity. It is imperative you provide the Basset Hound with sufficient exercise or they can become obese. Due to the fact that this breed is prone to obesity, it’s essential that you don’t overfeed them. When a Basset Hound becomes overweight, this places excessive stress on their spine and legs, which can eventually develop into lameness. Basset Hounds are also prone to other health problems including bloat, Von Willebrand’s disease (blood disease), paneosteitis (mysterious disease that causes acute lameness in young pups), glaucoma (eye disease), interdigital cysts, and otitis externa (smelly ears). Despite their health problems, the Basset Hound lives an average 10-12 years. The Basset Hound is a regular shedder and is not ideal for anyone who suffers from allergies. Aside from their shedding, the Basset Hound is easy to groom and only needs an occasional bath (twice a year). The toenails need to be trimmed regularly (approximately every 3 months), and their long ears should be cleaned once a week. The Basset Hound may be the perfect companion for you if you have children, enjoy the outdoors, and are willing to care and commit your love to them.